Oh well, I'm happy you're giving up your social and your gamelife for something like that, it's important and you seem to be dedicated. I wanted to play SC with you, but that can wait I wish you a lot of succes in you life. And yeah well I never played SC1, only 3 and 4. But the dreamcast was a superb console with lots of good games that were underrated. well yot will always be waiting for old dinosaurs like you return if you haven't got instinct by that time okay gonna be seroius dude now. We all will be better when TTT2 strikes, I have a strong feeling about it. Yoshi players will have easier life. Ralenzo... buddy... u play vf and sf... Doesnt yoshi sound like ONe of them... i mean button mashers cant really use him right... he is like vf/sf kinda character in tekken ? Yes and no, yoshimitsu is considered like one of the weakest character in tekken. But if you would include him in virtua fighter like he is in tekken, then he would be the strongest person in virtua fighter and you wouldn't be able to win from him. If you'd include him in street fighter he would never win cuz in street fighter you can throw fireballs. 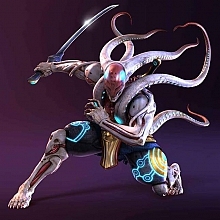 You cannot really compare yoshimitsu with a game, even in street fighter and virtua fighters are characters who are easy for "noobs" like button mashers and also character who are difficult to play with like yoshimitsu. Let me give you an example in street fighter you can't mash like in tekken or DOA but there are characters in street fighter who can use moves which are strong, are difficult to block and invincible for the first frames. Back in the days when street fighter was for the first time released you saw ALOT of ken players. Ken has a move called shoryuken, it's an uppercut that takes a lot of damage and is invincible for the first 3 frames or so. people would ALWAYS use shoryuken after they got knocked down, or after u gave them a punch or tried to combo, it was really frustrating and would sometimes end in a losing result. You can compare it too eddy his low combo strings, but ONCE u know how to block them you can do a huge deal of damage on eddy and that was the same case with ken players. In every game you got mashers, easy characters and difficult character. That was superb explanation ... Thanks Ralenzo..